AIDMI's publication of Southasiadisasters.net is titled 'Making Humanitarian Response More Flexible: Exploring New Models and Approaches' and highlights new approaches that can be taken by humanitarian organizations to effectively respond to the humanitarian challenges of the 21st century. Some of the important themes discussed in this special issue include adaptive programming by humanitarian organizations, context specific humanitarian interventions and culturally sensitive approaches to humanitarian action. This issue's contents includes: (i) Supporting Adaptive Approaches to DRR and Humanitarian Action; (ii) Proactive and Reactive Strategies for Knowing When to Adapt; (iii) What Do Shelterless Want after a Disaster? ; (iv) Daily Nudges: Using Community Feedback for Problem Solving; (v) CDP@20: Two Decades of Commitment to Resilience, Empowerment, and Development; (vi) Risking Cities and Rivers: What are the Pathways Towards Resilience? ; (vii) Making Humanitarian Response more Flexible: Responding to Context; (viii) Heart Head Healing in South Asia; (ix) Flexibility First: Why Flexibility is Essential in Humanitarian Work; (x) Landscape Planning for Risk Reduction and Resilience Building; (xi) Humanitarian Action: INGOs and State Flexibility; (xii) Emergency Response Network for Road Safety in Leh; and (xiii) Insights on Making Humanitarian Response More Flexible. 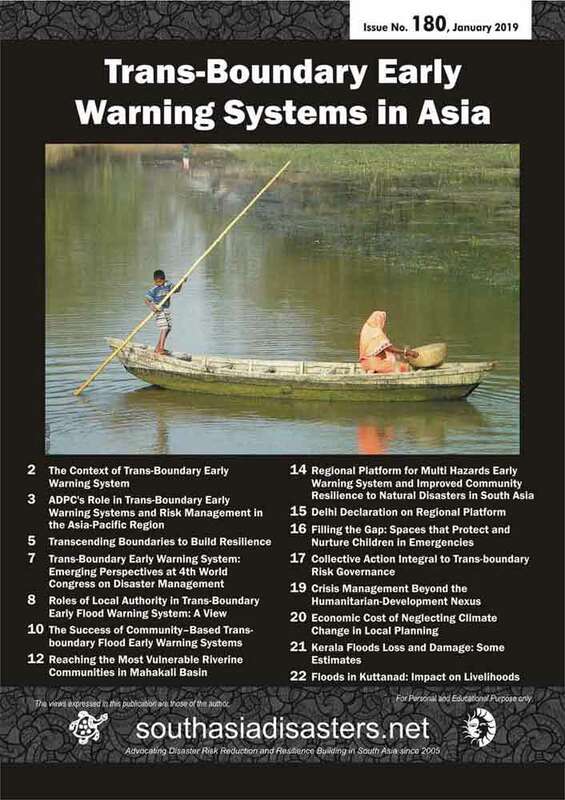 AIDMI's publication of Southasiadisasters.net is titled "Trans-Boundary Early Warning Systems in Asia" and focuses on the important theme of regional cooperation for DRR in Asia. Community based TB-EWS for flood risk have been given special importance in this issue because of their significance in South Asia. Such systems enable local communities to utilise local resources and capacities to prepare and respond to and enhance their resilience to flooding risk. Some of the other relevant themes explored in this issue include livelihood recovery, economic cost of climate change and protecting children in emergencies. This issue's contents includes: (i) The Context of Trans-Boundary Early Warning System; (ii) ADPC's Role in Trans-Boundary Early Warning Systems and Risk Management in the Asia-Pacific Region; (iii) Transcending Boundaries to Build Resilience; (iv) Trans-Boundary Early Warning System: Emerging Perspectives at 4th World Congress on Disaster Management; (v) Roles of Local Authority in Trans-Boundary Early Flood Warning System: A View; (vi) The Success of Community–Based Trans-Boundary Flood Early Warning Systems; (vii) Reaching the Most Vulnerable Riverine Communities in Mahakali Basin: Community-based Flood Early Warning Systems; (viii) Regional Platform for Multi Hazards Early Warning System and Improved Community Resilience to Natural Disasters in South Asia; (ix) Delhi Declaration on Regional Platform; (x) Filling the Gap: Spaces that Protect and Nurture Children in Emergencies; (xi) Collective Action Integral to Trans-boundary Risk Governance; (xii) Crisis Management Beyond the Humanitarian-Development Nexus; (xiii) Economic Cost of Neglecting Climate Change in Local Planning; (xiv) Kerala Floods Loss and Damage: Some Estimates; and (xv) Floods in Kuttanad: Impact on Livelihoods. Some of the best thinkers, researchers, experts, and activists, including Mihir R. Bhatt with AIDMI Team; Hans Guttman, Executive Director, ADPC; Atiq Kainan Ahmed, Senior Program Manager, ADPC, Thailand; Dr. Neera Shrestha Pradhan, Senior Water and Adaptation Specialist, International Centre for Integrated Mountain Development (ICIMOD), Nepal, and Sanjay Pandey, Executive Director, Yuganter, Bihar, India; Rajan Subedi, Team Leader, Trans-boundary Rivers of South Asia (TROSA), Oxfam, Nepal; Animesh Prakash, TROSA, Oxfam India; Nithi Nesadurai, Regional Coordinator, Climate Action Network South–East Asia; Vijeta Rattani, Programme Manager, Centre for Science and Environment, New Delhi, India; and D. Nandakumar, Professor (retd. ), Kerala University, Kerala, India. issue is the unfair structure of climate finance that can potentially keep developing countries in a perpetual debt trap. This issue's contents includes: (i) Active Risk Transfer and Insurance Initiatives; (ii) Livelihood After Disaster: Planning in Flood Affected Kerala; (iii) Dynamic Accountability of Global Disaster Risk Reduction Measures: A View for Dialogue; (iv) Disaster Risk Reduction in Rural Economy: View from NIRD; (v) Do Disasters or Climate Change Lead Adapting Countries to Debt Crisis? ; (vi) Reducing Disaster Loss and Damages in Malaysia; (vii) Building Community Resilience through Participatory Groundwater Management (PGWM) Approach. Some of the best thinkers, researchers, experts, and activists, including Mihir R. Bhatt with AIDMI Team; Dr. V. Suresh Babu, and Dr. Basavaraj Patil, National Institute of Rural Development and Panchayati Raj, Hyderabad, India; Isabella Dahl Kormilitzine, Director, Debt Justice Norway; Hafiz Amirrol, Building Resilient Communities Programme Development and Operations, MERCY, Malaysia; and Surbhi Arul, Nisha Subramanian, and Harshvardhan Dhawan, Arghyam, Bengaluru, India. Theme: Risk Transfer, Livelihood, Disaster Risk Reduction, Climate Change, Economy. tuations in an inter-disciplinary and systemic way. Disasters are often complex phenomena that impact the world in a variety of adverse ways. The possible triggers that can lead to large-scale death and destruction have been explored in this issue. This issue is also a valuable resource to researchers, practitioners and students interested in expanding their understanding on this particular theme. This issue's contents includes: (i) Moving Towards Avoidable Deaths; (ii) Incentivizing Transparency, Expediting Humanitarian Assistance, and Strengthening Civil Society; (iii) Women take the Lead: Turning Crises into an Opportunity for Development; (iv) Disaster Risk Reduction – Save the Nature and Nature will Nurture you; (v) How Can Asia Address Avoidable Deaths? ; (vi) Why Zero Mortality in Schools is a Myth; (vii) Non–Traditional Approaches to Finance for Disaster Recovery: A Few Examples for Consideration; and (viii) Impacting Lives through Skilling. Some of the best thinkers, researchers, experts, and activists, including Mihir R. Bhatt with AIDMI Team; G. Padmanabhan; Ben Smilowitz, Executive Director, Disaster Accountability Project, Rockville, MD, USA; Prema Gopalan, Founder and Executive Director, Swayam Shikshan Prayog, Pune, Maharashtra, India; Ankur Gupta, Department of Management Studies, Centre of Excellence in Disaster Mitigation and Management, IIT Roorkee, Uttarakhand, India; Dr. Nibedita S. Ray-Bennett, Associate Professor in Risk Management, Programme Director for the MSc in Risk, Crisis and Disaster Management, School of Business, University of Leicester, Leicester, UK; Chandra Bhakuni, Principal Structural Engineer, Ahmedabad, Gujarat, India; Elisa TAIWO, Research Assistant, Action Against Hunger, France; and Sarah Berry, Advisor, Communications and Media Outreach IL&FS Education and Training Services, Noida, Uttar Pradesh, India. Theme: Avoidable Deaths, Disaster Risk Reduction, Disaster Recovery, Civil Society. 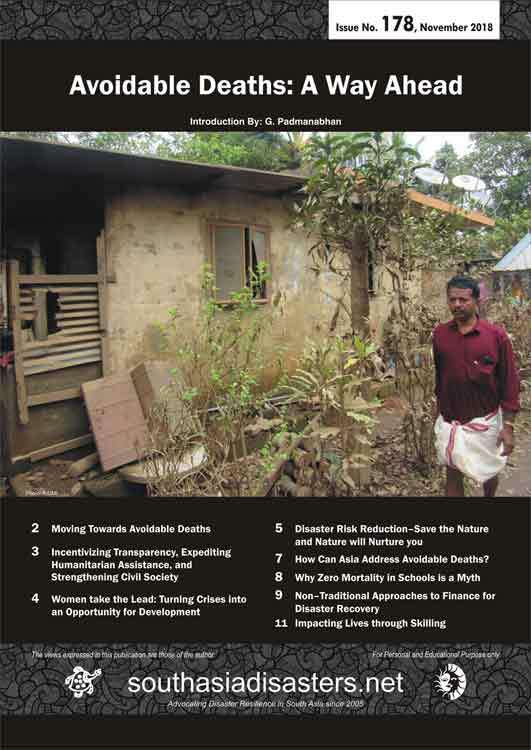 AIDMI's publication of Southasiadisasters.net is titled "Interplay of Disaster Risk, Climate Change, and Uncertainty" and highlights how the uncertainty related with disaster risk and climate change marginalizes at-risk communities by posing a serious threat to their overall development outcomes. Not only does this uncertainty manifest itself in different ways, it is also perceived by different people differently. For instance, there is a big gap in the way scientists and climate experts and at-risk communities perceive this uncertainty. While experts rely on quantitative models and projections, they are far removed from the lived experiences of at-risk communities who bear a disproportionate burden of the adverse impacts of this climate uncertainty. 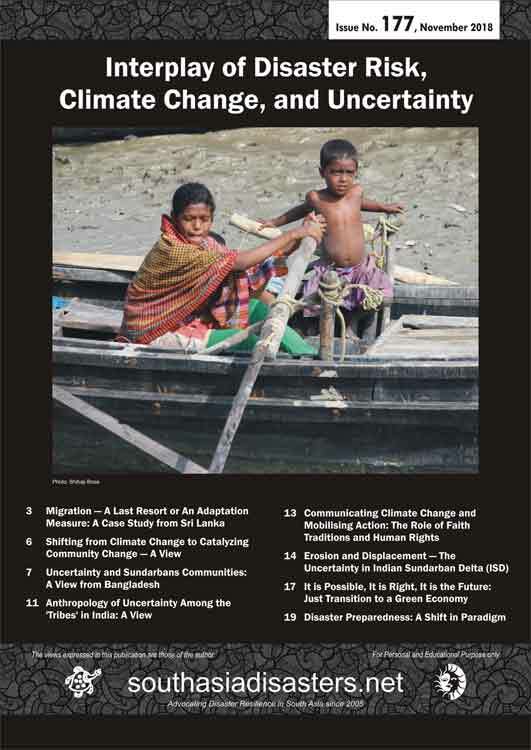 This issue's contents includes: (i) Interplay of Disaster Risk, Climate Change, and Uncertainty; (ii) Migration — A Last Resort or An Adaptation Measure: A Case Study from Sri Lanka; (iii) Shifting from Climate Change to Catalyzing Community Change — A View; (iv) Uncertainty and Sundarbans Communities: A View from Bangladesh; (v) Anthropology of Uncertainty Among the 'Tribes' in India: A View; (vi) Communicating Climate Change and Mobilising Action: The Role of Faith Traditions and Human Rights; (vii) Erosion and Displacement — The Uncertainty in Indian Sundarban Delta (ISD); (viii) It is Possible, It is Right, It is the Future: Just Transition to a Green Economy; and (ix) Disaster Preparedness: A Shift in Paradigm. Some of the best thinkers, researchers, experts, and activists, including Mihir R. Bhatt with AIDMI Team; Hasanthi Tennakoon, Karin Fernando, and Navam Niles, Climate Action Network South Asia - Sri Lanka (CANSA-SL); Dr. David Fletcher, Coady International Institute, St Francis Xavier University, Canada; Muhammad Taher, Independent Research and Evaluation Consultant, Balgladesh; Member, Steering Committee, Duryog Nivaran; Dr. Sunita Reddy, Associate Professor in Center of Social Medicine and Community Health, Adjunct Faculty in Special Center for Disaster Studies, JNU, New Delhi, India; Dr. Ben Wisner, Institute for Risk and Disaster Reduction, University College, London; Dr. Tuhin Ghosh, Associate Professor, and Shruti Thakur, School of Oceanographic Studies, Jadavpur University, Kolkata, India; Dagmar Walter, ILO Director, New Delhi, India; and Mahbuba Nasreen, Director and Professor of the Institute of Disaster Management and Vulnerability Studies (IDMVS), University of Dhaka, Bangladesh. Theme: Disaster Risk, Climate Change, Uncertainty, Human Rights, Green Economy, Disaster Preparedness. AIDMI's publication of Southasiadisasters.net is titled "Investing in Disaster Risk Reduction: Corporate Social Responsibility Initiatives in India" focuses on the theme of CSR led projects in India that have had a tremendous impact on the lives of marginalized communities and victims of humanitarian crises. 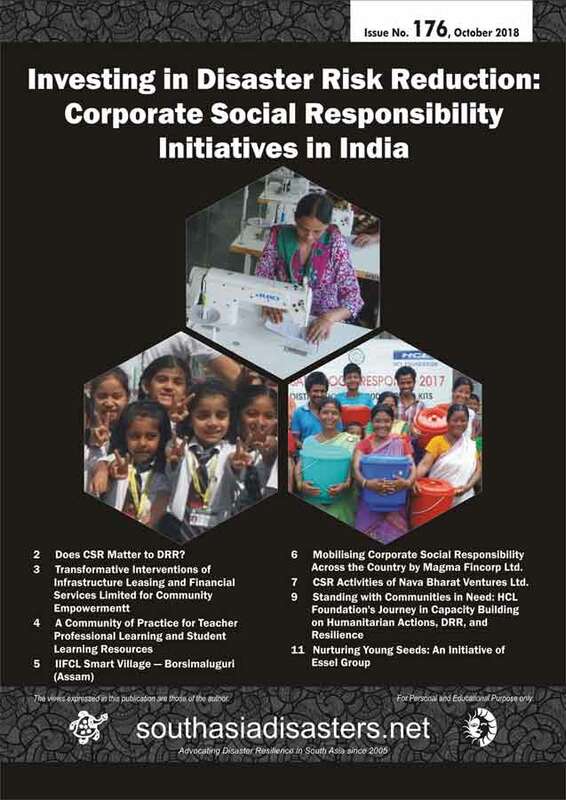 The emergence of CSR as a major player in India's humanitarian landscape is welcome because it has secured much needed financial resources for activities of social development which were earlier undertaken by cash strapped civil society organizations. CSR has also helped in improving the professionalism in and service delivery of social welfare programmes and projects. This issue highlights some of the laudable work done by major CSR entities like the HCL Foundation, IBM India Pvt. Ltd., Essel Group, IL&FS Services Ltd, etc. Responding to and planning for disasters and other emergencies has emerged to be a major focus area for CSR. This issue highlights how CSR can be leveraged to build the resilience of at-risk people and communities. 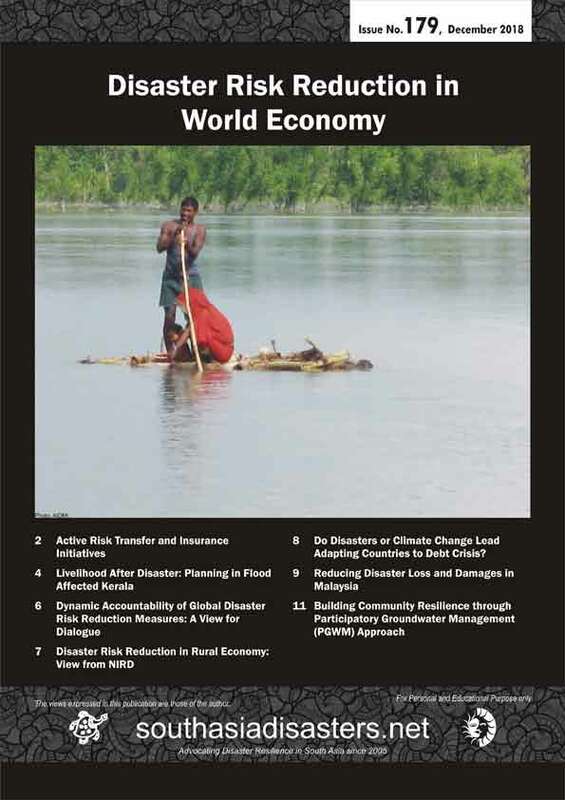 This issue's contents includes: (i) Does CSR Matter to DRR? ; (ii) Transformative Interventions of Infrastructure Leasing and Financial Services Limited for Community Empowerment; (iii) A Community of Practice for Teacher Professional Learning and Student Learning Resources; (iv) IIFCL Smart Village—Borsimaluguri (Assam); (v) Mobilising Corporate Social Responsibility Across the Country by Magma Fincorp Ltd.; (vi) CSR Activities of Nava Bharat Ventures Ltd.; (vii) Standing with Communities in Need: HCL Foundation's Journey in Capacity Building on Humanitarian Actions, DRR, and Resilience; and (viii) Nurturing Young Seeds: An Initiative of Essel Group. Some of the best thinkers, researchers, experts, and activists, including Mihir R. Bhatt with AIDMI Team; Sarah Berry, Advisor, Communications and Media Outreach, IL&FS Education and Technology Services (IETS), Uttar Pradesh, India; Joyeeta Das, Program Manager, Corporate Citizenship, IBM India Private Limited, Bengaluru, India; Amit Kumar, Deputy Manager, India Infrastructure Finance Company Limited, Borsimaluguri, Assam, India; Kaushik Sinha, Vice President, Magma Fincorp Ltd., Kolkata, West Bengal, India; Mohammad Ali, Chief Administrator (SD), Nava Bharat Ventures Limited, Hyderabad, Telangana, India; Ms. Nidhi Pundhir, Director-HCL Foundation, CSR Head-HCL Technologies, Noida, Uttar Pradesh, India; and Priti Goel, Essel Group, Nurturing Young Seeds, Noida, Uttar Pradesh, India. AIDMI's publication of SouthasiadisaAIDMI's publication of Southasiadisasters.net is titled "Understanding Recovery in Andaman and Nicobar Islands" and highlights the various aspects of the post–tsumani recovery process there. This issue focuses on many themes related with the recovery process in the islands such as the importance of understanding the underlying factors of vulnerability, the role of international humanitarian agencies in assisting the recovery, civil–military cooperation in the response efforts, importance of housing, food and nutrition for a sustainable recovery and rehabilitation, etc. Most importantly, this issue highlights the nature of vulnerability and risk reduction in these beautiful islands. 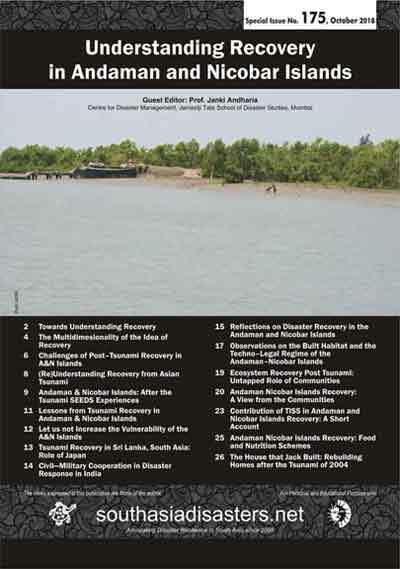 This issue's contents includes: (i) Towards Understanding Recovery; (ii) The Multidimesionality of the Idea of Recovery; (iii) Challenges of Post–Tsunami Recovery in A&N Islands; (iv) (Re)Understanding Recovery from Asian Tsunami;; (v) Andaman & Nicobar Islands: After the Tsunami SEEDS Experiences; (vi) Lessons from Tsunami Recovery in Andaman & Nicobar Islands; (vii) Let us not Increase the Vulnerability of the A&N Islands; (viii) Tsunami Recovery in Sri Lanka, South Asia: Role of Japan; (ix) Civil—Military Cooperation in Disaster Response in India; (x) Reflections on Disaster Recovery in the Andaman and Nicobar Islands; (xi) Observations on the Built Habitat and the Techno–Legal Regime of the Andaman–Nicobar Islands; (xii) Ecosystem Recovery Post Tsunami: Untapped Role of Communities; (xiii) Andaman Nicobar Islands Recovery: A View from the Communities; (xiv) Contribution of TISS in Andaman and Nicobar Islands Recovery: A Short Account; (xv) Andaman Nicobar Islands Recovery: Food and Nutrition Schemes; and (xvi) The House that Jack Built: Rebuilding Homes after the Tsunami of 2004.